Tension Sails are the most popular style of sail, because they offer almost endless design possibilities. The tension to create the sail and pull it out and up is determined by the placement and position of the posts and the building or house points during installation. 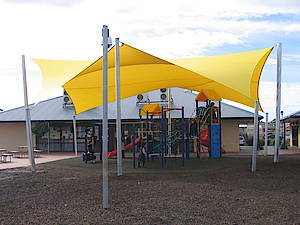 Shady Places ensure all connection points are designed and installed to the highest of standards to extend the durability and lifespan of the sail.